Sage Steele will join other women as she runs her way through Disney World at the upcoming Disney Princess Half Marathon on Feb. 26. Women's races offer a decidedly different vibe than their coed cousins: more camaraderie, a sole sister atmosphere that welcomes all runners and walkers and lots more running skirts. Here are five of the top women's races and series in the country. Sign up, then train like Sage. Sage picked a winner. 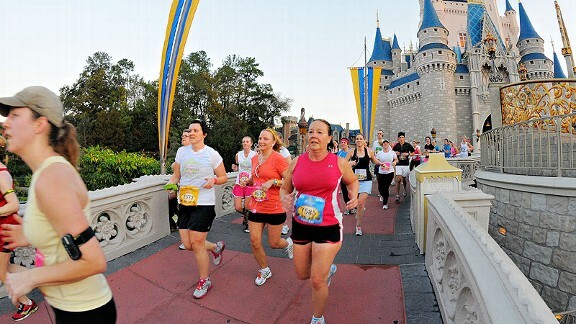 Let your inner child run free through the Magic Kingdom at these festival race weekends. Tinker Bell is in Disneyland, while Princess is in Disney World, but both allow thousands of runners to mix and mingle with Disney characters on courses that wind through each park. Racers put almost as much effort into costumes -- Snow White, Belle or Minnie, anyone? -- as training. Bonus: Your kids will be especially psyched to cheer you on. Yeah, it's tough to snag an entry, but if you can, this race is so worth it. (Psst: Go through Team in Training.) This 26.2-mile race, and its half-marathon companion, traverses San Francisco with sweeping vistas of the Golden Gate Bridge and Pacific Ocean to take your mind off the killer hills in the first 10 miles of the race. Tuxedo-clad firefighters bestow each finisher with a Tiffany & Co. pendant. Started by a woman runner, this five-race series knows how to please the ladies, especially with its boutique-like, post-race party complete with wine (always a good post-race choice) and fun vendors. Each race is set in a venue where you'll want to escape for a girlfriends' get-away, like Cape Cod and the Texas Hill Country outside Austin. Most of the courses are hilly, but that gives you all the more reason to celebrate with your running buddies once you kill the hills. This race's take-charge name alone makes it a winner. We also love the 10-mile distance, eliminating that final 5K of a half-marathon when the wheels too often fall off our proverbial bus. There's also a 5K option and a 1-mile girls' race. The loop course mostly hugs the banks of the mighty Mississippi as it moves from Minneapolis over to St. Paul and back again. Celebrate -- and run, walk or do a combo -- through all 3.1 miles of this Boise, Idaho, race, the largest women's 5K in the country. Founded by Anne Audain, the winningest road racer in history, this race weekend also encompasses a massive female-centric expo. McDowell and Shea are co-authors of the book "Run Like a Mother: How to Get Moving and Not Lose Your Family, Job, or Sanity," (Andrews McMeel, 2010) and "Train Like a Mother: How to Cross Any Finish Line and Not Lose Your Family, Job, or Sanity," which will be released in mid-March.